Meditation is a tool that I try to use with most all of my clients. Many clients believe that meditation is for controlling your thoughts. A way to be able to think about nothing. To clear your mind. Most of these beliefs, however, are false. Meditation is about learning to be mindful, to be calm, in the midst of your thoughts and emotions and to not get stuck in them. Headspace is an app I have used for several years now for guided meditation with clients and for myself. The main goal of this particular meditation app is to help you train your mind to see thoughts, become aware of them, notice how they make you feel, and then to let them pass through your mind instead of taking up residence in it. Not thinking is never the goal. Not feeling is never the goal. It is to think and feel without allowing those thoughts and emotions to control you. You control them and by doing so, you can let them go. Many people view their thoughts as something their brain is telling them. The brain only tells you what you have put in. Human brains are like very powerful computers and like all computers brains digest and spit out what you put into them. Your brain did not on it’s own start thinking negative things about you. It did not start believing these things by itself. You told it to do so and so it did. You repeatedly told it what you believe about yourself, your life, your relationships and it believes you and then works to make these things all true because they must be true – you said they were. These millions of thoughts that are input and then become stuck are what we allow to control how we think and feel every moment of every day. 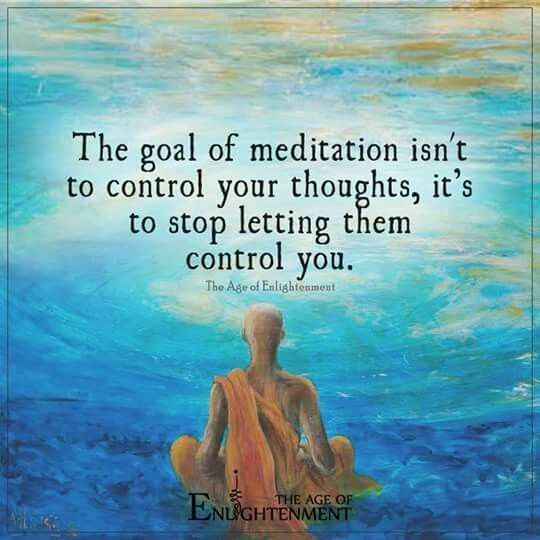 Meditation is about taking control over those thoughts and not allowing them to be stuck. Imagine that whatever thought you are thinking at the moment is in a cloud. See it, become aware of it. However, just like clouds that you have watched millions of times, they never remain in the same place, ever. They come and they go. Imagine your thought cloud coming and then going and when it is gone it is gone. Say to yourself, I am having the thought that (insert thought here) and I am letting this thought go. And when it leaves return your focus to your breathing and only your breathing. Next thought comes and we do the same thing again. We are in control of our thoughts. It just takes practice. The second piece of resistance clients can have is stating they have no time for meditation. Do you spend 10 minutes a day just scrolling through your phone or online just scrolling, not really doing anything of consequence? Do you have 10 minutes before you fall asleep that you are just lying in bed with your thoughts? If you do, you have time to meditate. It doesn’t take hours, just a few minutes to begin to take control over your thoughts and to stop letting them control you. Remember, the goal of meditation is not to get rid of thoughts and emotions but to become more aware of them, to learn how to move through them without getting stuck. If you think counseling could help you learn how to control your thoughts and emotions, set up a FREE initial consultation with me by calling 406-413-9904 or email mindfulmontanawellness@gmail.com or visit Mindful Montana Wellness on Facebook and click the Book Now button.